Communications regulator Ofcom today ruled that Sky - which is nearly 40 per cent owned by Rupert Murdoch's News Corp - IS fit and proper to hold a TV broadcast licence. However Murdoch's son James - formerly chairman of BSkyB and still involved in running the family empire - was savaged by the watchdog, which questioned his managerial conduct and described some of his actions as "ill-judged" and difficult to comprehend. In July last year, at the height of the UK centred phone-hacking scandal that swamped the Murdoch media empire, Ofcom finally responded to political pressure and waded into a row over News Corp's bid to takeover the remaining majority chunk - about 60 per cent - of BSkyB it didn't already own. Ofcom had previously said it would wait for the police to complete an investigation into allegations relating to voicemail-tapping and other alleged misdeeds at Murdoch's British newspaper business, News International, before it would consider intervening on News Corp's proposed takeover of BSkyB. When the regulator confirmed it would carry out a so-called "fit and proper" test of Sky's ability to hold a broadcasting licence, James Murdoch held chairmanships at BSkyB and News Group Newspapers - the parent company of News International. In April this year, he quit his BSkyB chairman's role, which followed his departure in February from News International. James Murdoch now resides in New York where he works in his dad's stateside telly biz. But he remains as a non-exec director at NI and BSkyB. 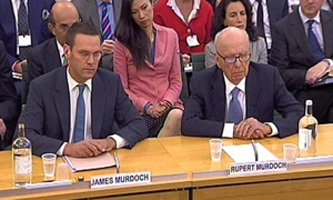 In the circumstances, and notwithstanding our views in relation to James Murdoch’s conduct, we do not consider, having taken into account all the relevant factors, that on the evidence available to date Sky is no longer fit and proper to hold broadcast licences. Whilst we consider that James Murdoch’s conduct in various instances fell short of the standard to be expected of the chief executive officer and chairman, we do not find that James Murdoch’s retention as a non-executive director of Sky means that Sky is not fit and proper to hold broadcast licences. We recognise that whether it is appropriate for James Murdoch to be a director in light of the events is a matter for the Board and shareholders of Sky. The regulator repeatedly brought into question James Murdoch's competence as one-time CEO and chairman of News International. It's a hypothetical question. As part of this ongoing duty, we reached a decision based on the facts and evidence at the time. The facts are that James Murdoch is no longer at the helm of Sky: it's more than possible to imagine that if that were not a fact, a different decision might have been made. Even now, his relatively minor presence at Sky remains a touchy point for the broadcaster. Although today’s NAND flash storage has its roots in 30-year-old technology, innovation has negated almost all of the challenges that are inherent in the media.